Alore Events is well equipped and best suited to offer niche services in event planning, administrative and operational support. We have the expertise and capacity to handle all event planning requirements from booking sites, negotiating contracts, scheduling speakers, travel, entertainment, marketing, on-site support, registration, catering, finances, technology, and surveys. Toronda is very responsive and always follows through on commitments. Having worked alongside Toronda, I can attest to the fact that she is a major force in the event planning and workforce development industries. I know that I can always count on Toronda and her passion in delivering high caliber services and outstanding business results catered to professionals in our industry. She takes the time to learn about the environment and culture in which she operates which gives her an excellent understanding of the resources needed to execute a successful event. She is very responsive and always follows through on commitments. Toronda’s attention to detail is impeccable. I have had the pleasure of working with Toronda through our involvement with the SETA conferences over the past two years. Toronda is amazing to work with for these events! Her attention to detail and insight to the needs of the exhibitors is impeccable. She is on top of the events to an almost clockwork procedure. We collectively love attending the SETA events in part because of the experience we have had working with Toronda on the planning stages to make the event as smooth as it is! Toronda has my highest recommendation. I have worked with Toronda since 2011 and have found her to be very professional. I am always impressed with her enthusiasm, communication skills and attention to details. Toronda is reliable, dedicated and eternally upbeat. Her ability to manage situations and items that come up is always professional and upbeat. Of course being a planner, multitasking is a must and Toronda seems to do it with ease. Organized and diligent, Toronda quickly moves from one task to the next putting out any fires in her way. One of her amazing strengths was her planning meetings and attending school to get her Bachelor’s degree in Hospitality Administration. Her level of energy truly amazed me and was such a good example for her daughter who was in college at the time as well. Toronda has my highest recommendation. I have been extremely impressed by Toronda’s professionalism and hard work. Toronda has been instrumental in the planning and implementation of conference events and the provision of board support for our organization which attracts up to 1,000 industry professionals each year. From site selection, attendee registration, speaker, vendor and exhibitor solicitation, fiscal management, board support and onsite coordination, she does it all. Toronda takes the necessary steps to ensure that the planning process embodies SETA’s core vision while paying attention to every detail and ensuring perfect synchronization. Toronda is well organized, highly skilled and a trusted advisor. I have received numerous positive comments regarding her work style, enthusiasm and dedication from board members for whom she provides support, as well as, industry professionals, partners, and stakeholders. I look forward to continuing to nurture this relationship in the years to come. Toronda is a pleasure to work with! I have known and interacted with Ms. Webb for the past IO years. I have always been impressed with her high level of professionalism, her great disposition, the personal touch she applies when engaging with customers and her overall happy outlook on life. She has provided me and the company with outstanding assistance and support when processing registrations and coordinating booth set ups, conforming to deadlines for shipping materials to the event site and providing advertising information and materials. She has always demonstrated a great level of attention to detail, follow up and prompt response to calls or emails. Based on the pricing she has been able to offer us through the years to participate in several events, I gather that her talents also extend to contract negotiations when it comes to venues and hotels. In short, she is a pleasure to work with, and undoubtedly has the skill set required to do her job very well!! Toronda Webb is wonderful to work with. Toronda Webb is by far one of the best Meeting Planners that I have had the pleasure of working with. One of the great things about working with Toronda is that she is very knowledgeable of how the convention world works, not just her end of the planning process, but on the operational side (my end) as well. Because of her vast knowledge and understanding of the process, we were able to work together and execute a very seamless event that showcased many moving parts. She knows how to anticipate things that could go wrong in her program and effectively communicates what preventive measures she would like in place to keep those challenges from arising. Her attention to detail is impeccable and her knowledge and understanding of the logistics makes her a true professional. 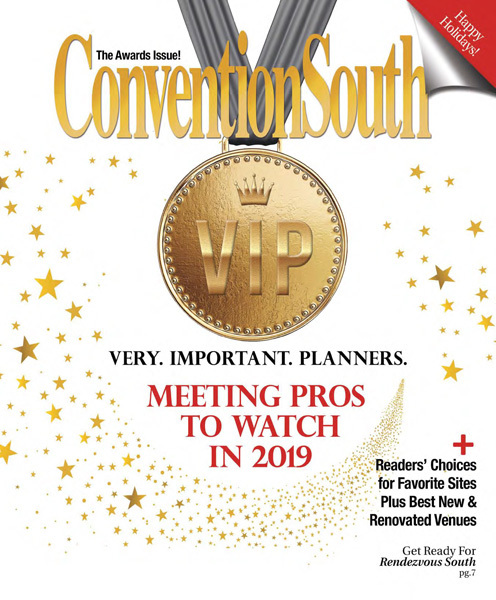 ConventionSouth proudly announces Meeting Professionals To Watch in 2019.
of conferences, conventions, retreats and training sessions, as well as coming up with new and engaging approaches to all types of group gatherings. Want more? Let us keep you updated! Alore Events (c)2014. All Rights Reserved.